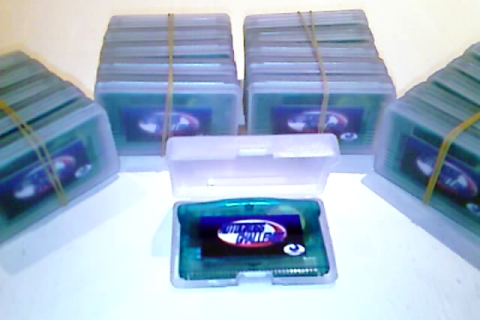 Before you get excited at the prospect of buying GBA cartridges from us, this page is for historical purposes only. Within a couple of years of the introduction of the Nintendo DS, finding blank, flashable GBA cartridges became near impossible - and it was pretty dodgy buying the batch we did in the first place (imported from pirates in China via cash transfer). 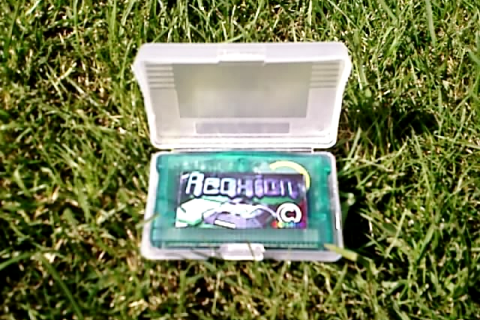 However, the few limited runs of cost-price homebrew GBA cartridges that we released proved to be very popular, selling at about the same rate as we could flash and package them up. Brief details on each release are given below, together with the downloadable GBA .rom files. Grumpy Cat Software (2003) / RGCD (2007). 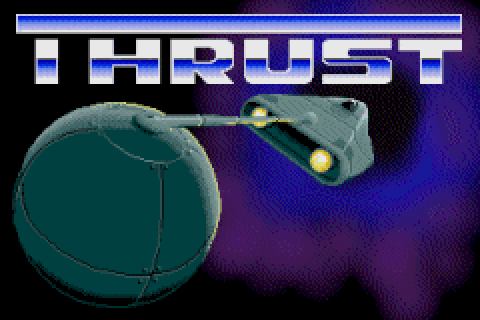 This faithful remake is based on Firebird's Atari ST port of the BBC classic and features all ten worlds from the 16-Bit release (as well as the later reverse gravity and invisible wall variations), so fans of the original will feel immediately at home. Somewhat surprisingly, the game works really well on the GBA - even when you take the handheld's tiny screen into account. Everything has been redesigned around the console; the graphics have all been redrawn and anti-aliased so as to look as smooth and vector-like as possible and the controls have been thoughtfully configured so that the d-pad is only used for rotating and the A, B & right shoulder buttons act as fire, thrust and shield/tractor beam respectively. It's clear that Grumpy is a massive fan of the original - a lot of love has gone into getting every part of this GBA tribute just right; the mechanics all work the way they should and Thrust's high difficulty is matched only by its equally addictive game-play. Download the normal version of the .rom file here (from the RGCD server). Download the heavy gravity version of the .rom file here (from the RGCD server). Run it using Visual Boy Advance (Freeware). DHG Games (2007) / RGCD (2007). 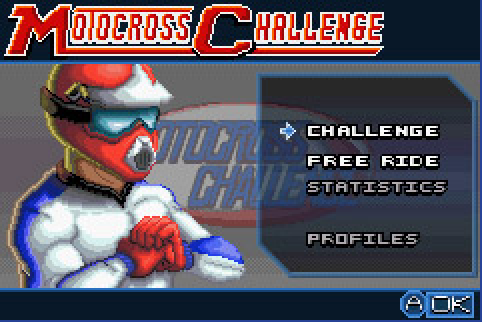 Originally planned as a commercial GBA release, Motocross Challenge had been in development for three years by relatively small indie developer DHG. In 2006 they signed the game to what they describe on their website as "a very big and international publisher that shall remain unnamed". After a further six months of solid work, the game was finally completed in February 2007 - yet while it was in final testing the publisher decided that the GBA market wouldn't support enough sales of a non-licensed game to make releasing it worthwhile. The project was thereafter cancelled, despite just needing to be written to a cartridge, stuck in a box and shipped to the shops. Without the necessary resources to port the game to another platform and with a strong desire to actually let someone play the damn thing, DHG made the amicable decision to host their opus for download from their website. However, following our glowing review of the game, we at RGCD thought that this outstanding title should be given the proper cartridge release that it deserves. So with DHG Games' authorisation we've created a limited batch of MXC cartridges for you to buy and plug into your GBA, SP, Micro or DS! Download the .rom file here (from the RGCD server). Cosine (2007) / RGCD (2007). Cosine and RGCD are proud to present Reaxion GBA, as reviewed in RGCD#03 (where it received a huge 90% score). 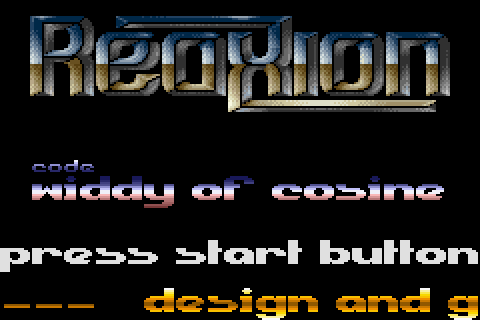 Cosine's Reaxion is officially the group's most ported game; it's simple premise has also been translated from the C64 to the C128, Commodore Plus/4 and Atari XE/XL (with Spectrum, NES and GameBoy Color versions in the pipeline). However, I reckon they'll be hard pushed to beat this incarnation of their popular puzzler. So what's it all about? Well, the background story sees you playing the role of a nuclear power-plant operative deep in the bowels of the Wenley Moor power station. The plant's main CPU has become infected with a nasty computer virus, resulting in all the immediate shutdown of all safety system and complete randomisation of the reactor core settings. Clearly this is not good news. Your task is to reset all 99 dangerously unstable reactor cores before they go critical. Fail, and its goodbye planet Earth; Succeed, and the government will probably cover up the whole mess and have you permanently 'silenced' anyway - but hey, that's life! Paradise Games (2007) / RGCD (2007). For the last couple of years, Ian and the rest of the Paradise team have entered the Christmas game development competition hosted by www.drunkencoders.com, winning the competition in 2005, and being unfairly placed at a considerably lower position in 2006. After playing their games extensively I had a brainwave; perhaps Paradise Games would be interested in working with RGCD to create some sort of Christmas-themed compilation for our readers? 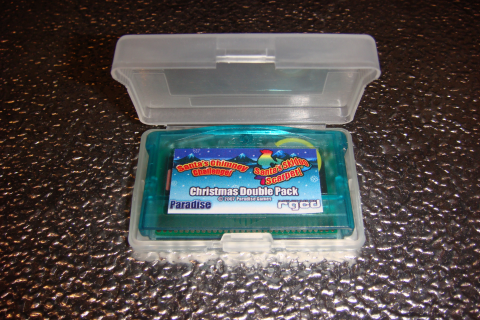 A few emails later and the Paradise/RGCD Christmas Double Pack GBA cart was born. Limited to 50 copies, the double-pack (which is a deliberately erroneous title as the cart actually includes a third hidden game..!) 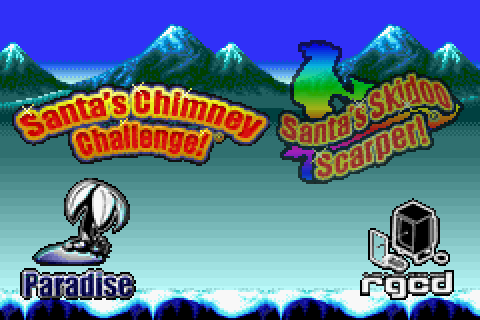 contains both Santa's Chimney Challenge and Santa's Skidoo Scarper; arguably the best Christmas themed releases to grace the GBA platform. The above RGCD homebrew cartridge releases are not licensed or endorsed by Nintendo of Europe, Nintendo Co. Ltd or any of their associates or subsidiaries. All program code, concept and assets have been developed without the use of any official documentation, software, hardware or any other information protected by Non Disclosure or other Agreements. Nintendo, Game Boy, Game Boy Advance and Nintendo DS are trademarks of Nintendo Co. Ltd. 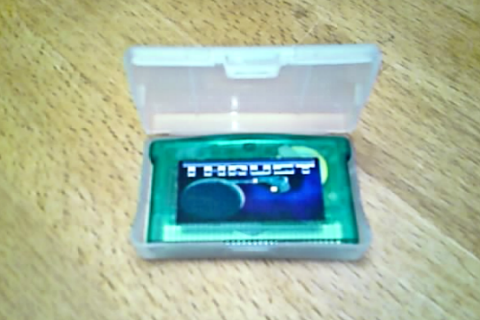 This project and these cartridges are 100% unofficial. All rights reserved. All trademarks are the property of their respective owners.